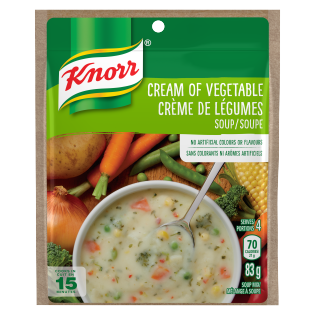 Knorr Cream of Vegetable Soup Mix is a creamy blend of potatoes, onions, corn, peas, carrots, brocoli, red bell peppers, garlic and leeks. It's delicious served as a soup or when added to your favourite recipes, like our classic Spinach Dip. Enjoy Knorr Dry Soups for a delicious snack, heartwarming meal or as an addition to your favourite recipe for an extra boost of flavour. Corn starch, wheat flour, dried vegetables (potatoes, onions, corn, peas, carrots, broccoli, red bell peppers, garlic, leeks), corn syrup solids, modified milk ingredients, hydrogenated soybean oil, monosodium glutamate, salt, natural flavour, canola oil, guar gum, dried parsley, potassium phosphate, sodium silicoaluminate, spices, yeast extract, disodium guanylate, disodium inosinate and sulphites. 1. In a large saucepan, whisk soup mix with 3 cups (750 mL) cold water and 1 cup (250 mL) milk. Bring to a boil over moderately high heat, whisking constantly. 2. Reduce heat, cover partially and simmer gently 5 minutes, whisking occasionally. Makes 4 servings.